Otsuka’s quietly disturbing novel opens with a woman reading a sign in a post office window. It is Berkeley, California, the spring of 1942. Pearl Harbor has been attacked, the war is on, and though the precise message on the sign is not revealed, its impact on the woman who reads it is immediate and profound. It is, in many ways she cannot yet foresee, a sign of things to come. She readies herself and her two young children for a journey that will take them to the high desert plains of Utah and into a world that will shatter their illusions forever. They travel by train and gradually the reader discovers that all on board are Japanese American, that the shades must be pulled down at night so as not to invite rock-throwing, and that their destination is an internment camp where they will be imprisoned “for their own safety” until the war is over. With stark clarity and an unflinching gaze, Otsuka explores the inner lives of her main characters—the mother, daughter, and son—as they struggle to understand their fate and long for the father whom they have not seen since he was whisked away, in slippers and handcuffs, on the evening of Pearl Harbor. 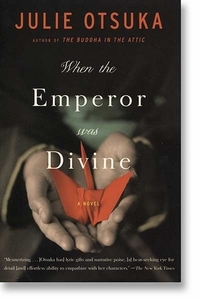 Moving between dreams, memories, and sharply emblematic moments,When the Emperor Was Divine reveals the dark underside of a period in American history that, until now, has been left largely unexplored in American fiction.